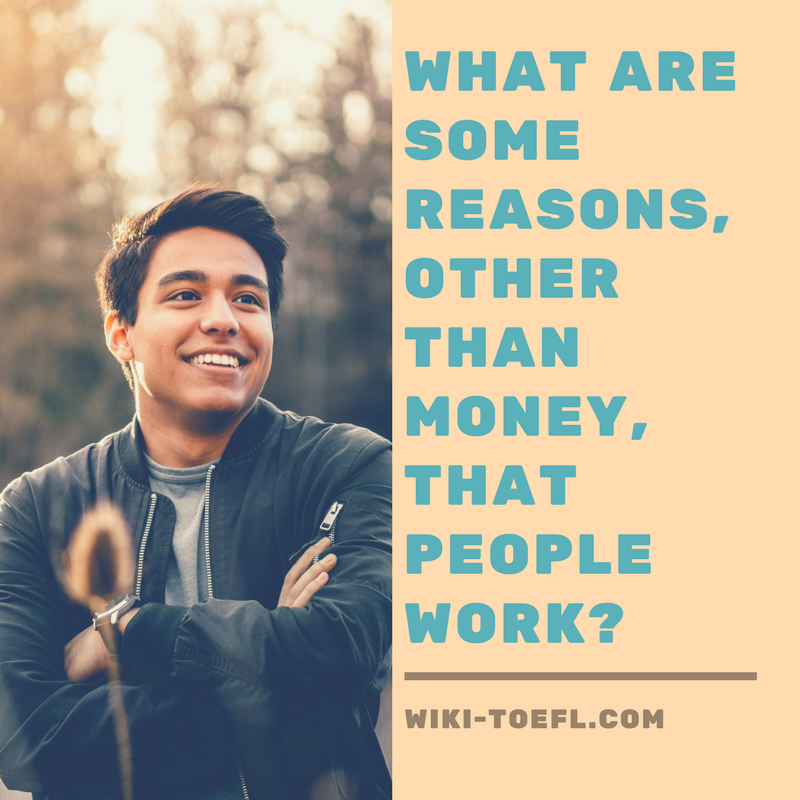 Home Writing	Toefl writing: What are some reasons (other than money) that people work? People work because they need money to live. What are some other reasons that people work? Discuss one or more of these reasons. Although people work to earn money, money is not the main reason people stay in their jobs. They also work because they enjoy working, they receive job satisfaction, and they like the sense of accomplishment. Most people work for work’s sake. They enjoy going to an office, or store, or school each day. They like to interact with other people. They like to help people solve problems, learn something, or get a product. People like to help other people. A lot of people keep the same job because the job gives them a lot of satisfaction. They genuinely enjoy what they do. This is true for most teachers. A teacher’s pay is not very great, but the job satisfaction can be very high. Helping someone learn is one of the greatest things anyone can do. People enjoy their work because they like the sense of accomplishment. They like to know what they finished a project. People, who work in factories, take pride in the car they produce or the television they assemble. When they see a car on the street, they can feel a sense of accomplishment. They helped make that car. Money is nice, but it is not the only reason people get up and go to work each day. I believe that people work because they enjoy the act of working; they find their work personally rewarding; and they like the feeling of a job well done.